OBJECTIVES: To study the effect of oral administration of grape seed oil (GSO) against carbontetrachloride (CCl4)-induced hepatotoxicity in rats. METHODS: Liver damage was induced in male Wistar rats (150-250 g) by administering CCl4 (0.5 ml/kg, i.p.) once per day for 7 days and the extent of damage was studied by assessing biochemical parameters such as alanine aminotransferase (ALT), aspartate aminotransferase (AST), and alkaline phosphatase (ALP) in serum and concentrations of malondialdehyde (MDA), hydroperoxides, glutathione (GSH), catalase (CAT), superoxide dismutase (SOD), and total protein (TP) in liver. The effect of co-administration of GSO (3.7 g/kg, orally) on the above parameters was further investigated and compared with a vitamin E (100 mg/kg, orally) treated group. Histopatholgical studies of the experimental animals were also done. RESULTS: Oral administration of GSO (3.7 g/kg, body weight orally) for 7 days resulted in a significant reduction in serum AST, ALT, and ALP levels and liver MDA and hydroperoxides and significant improvement in glutathione, SOD, CAT, and TP, when compared with CCl4 damaged rats. The antioxidant effect of GSO at 3.7 g/kg for 7 days was found to be comparable with vitamin E (100 mg/kg, orally) in CCl4-treated rats. Profound fatty degeneration, fibrosis, and necrosis observed in the hepatic architecture of CCl4-treated rats were found to acquire near - normalcy in drug co-administered rats. CONCLUSION: The GSO has protected the liver from CCl4 damage. Probable mechanism of action may be due to the protection against oxidative damage produced by CCl4. 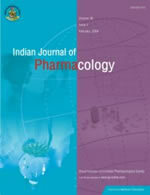 © Copyright 2005 Indian Journal of Pharmacology.